This blog is part of a series on getting started with RoundTable: Squire and covers getting everything installed. The next post in the series will walk you through the steps necessary to use Squire to start learning the C# programming language. Squire is a Round Table project that was created as a learning tool for those new to C# development. It is used as part of the Round Table training approach much like Katas in martial arts. Squire uses Kihons, a Japanese term meaning “Basics” or “Fundamentals” to provide repeatable exercises that help you learn the C# language. Round Table Members believe that mentoring is central to learning, and even though working with Squire alone can certainly help you get a jump start with learning programming with C# we believe that establishing a relationship with a mentor is the best way to accelerate your learning. Round Table Craftsman is not only about practicing techniques, but is also about fostering the correct sprit and attitude to develop a well rounded technical expert. SharpDevelop is a free integrated development environment (IDE) for C#, VB.NET and Boo projects on the Microsoft’s .NET platform. The Round Table team chose SharpDevelop because it is free, and integrates with nUnit and is a full development environment. This lowered the barriers of entry, mainly cost for those interested in learning programming with C#. Download SharpDevelop and install it with the typical settings. At the time of this post the current version is 4.2 RC. nUnit is a unit-testing framework for all .NET languages which was initially ported from JUnit. nUnit integrates directly with SharpDevelop allowing you to execute the test and see the results without leaving the SharpDevelop IDE. Download nUnit and install it with the typical settings. At the time of this post the current version is 2.6. Download Squire and extract it to a location on your hard drive. Ok, that’s it, you now have all the tools installed necessary to start learning the C# programming language using Squire. The next post in this series will cover opening the Squire solution and running through an exercise (kihon). The next Northwest Arkansas .Net User Group meeting will be held May 8, 2012 at 6:00 PM at Rockfish in Rogers. Jon Parker will be presenting on PowerShell for Developers. Please RSVP before noon on May 8th so we can order enough food for everyone. Jon has been programming since 2001 at BYU-Idaho. He discovered .Net in 2003 and hasn’t looked back since. While Jon started out with web programming, his current passion is tweaking applications for speed. Jon boasts taking a 30 min Unix C process to .Net that now runs in < 3 min. Jon is currently employed at Wal-Mart Stores Inc. He is married and has 1 child. In his spare time he codes (of course) and builds tree houses. Send you kids to camp, Tech Adventure Camp! A college of mine has put together an awesome tech camp for kids. They will be learning Web Development, Programming with Python, and Graphic Design over a three week period. If you children (ages 7 to 16) are interested in technology then check the Tech Adventure Club out. Some tracks have prerequisites. Please check the details of your selected track for more information.With the Windows 8 and MicroElectronics tracks you will need to install and/or buy items before coming to conference. Check your tracks at Tulsa School of Dev website for more information. 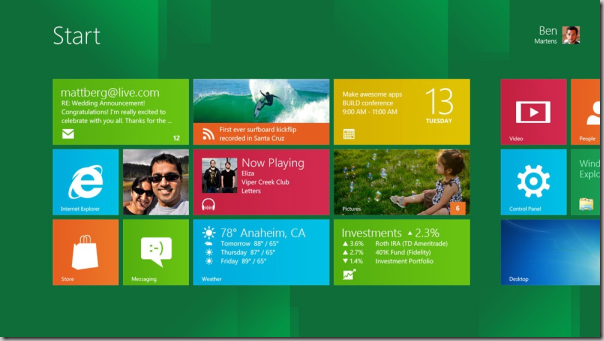 Today Microsoft has released a consumer preview of the Windows 8, the next version of the Windows Operating System. Download the Windows 8 Consumer Preview here. Microsoft Developer Evangelist Jennifer Marsman has posted an awesome list of resources to help you get started developing applications for Windows 8. I have also gathered some useful links for Windows 8 on http://delicious.com/jay.smith/Win8.